Boxing legend Nonito Donaire is adamant that he has the threat of Carl Frampton dissected to such a degree that on Saturday night at the SSE Arena he simply cannot lose. The four-weight world champion will enter their featherweight duel as the underdog but the 35-year-old insists he has never been in such condition, mentally or physically. "I have an acceptance that I have the power, the skills, the knowledge and the intelligence to win this fight. 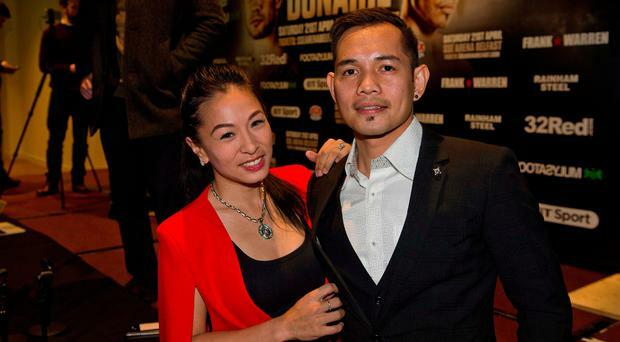 I have all the things needed to beat him," said Donaire, speaking exclusively to the Belfast Telegraph. "It's funny because for my wife and I it's like we are married to Carl because we watch him every day, we talk about him, we know exactly what he does and that's why I don't even have to think about this - I know what to do. "The fact is that I have never fought at my best. I was always around 70 per cent... when I would reach 10 rounds and then I would just do what I had to because I knew the fight was won. I believe that Carl Frampton is getting the 100 per cent Nonito Donaire. "I've never thrown as many punches, I haven't felt this confident in a long time - I feel like I'm 21 again. "When you become so experienced there is so much knowledge that you can over analyse and in my biggest fights there were times when I had so many analytical things going on and that meant I couldn't go and perform the way I wanted. "Now I just want to go out there and have fun. "There has been a lot of self development, the ability to be one with yourself. I go into this fight with no doubts, I go in with the mind that I have trained and I know what I will go out and do. I feel re-born and there is no attachment to the result. "What freaks people out is the attachment to a certain outcome... because we let our mind take control of the imagination. "Fighters are thinking 'I need this result to get to the next stage'. We are constantly bombarded by thoughts and when we entertain them they create stories in our head but if we learn to be aware they are thoughts, they are not real then we don't allow them to get real and lead us into a state of nervousness or panic that you see with athletes before they get to the ring." Donaire has had many highs and some lows during his glittering career and it was one particular loss that actually re-ignited him, a painful defeat at the hands of Cuban great Guillermo Rigondeaux in 2013. "I had started to lose my edge in training. The fight before it I had beaten Jorge Arce and I told my team I'm going to retire and then I was offered a great deal of money to face Rigo and I fought. I suppose that was the only time I fought for money, I just thought why not?" Donaire explained. "I had a very bad shoulder going into the fight and had surgery on it afterwards. They told me that I should have surgery on it before and I didn't bother. I just thought I'm alright, I can land one shot and it will be all over. "I fought with the wrong motivation that night. The real motivation had gone, I fought for the wrong reasons, thinking if I lost I'm walking away but then when I did lose it hurt so much because I believed I could have fought so much better. "I look back at that fight and say that is the person I don't want to be. Now I'm back to being the person I want to be, I'm back!"